It really looks crazy messy under there doesn't it? Look carefully though at the height you have your pickups set, this can make a noticeable diiference if it's not right. 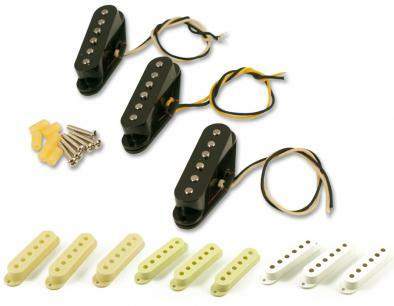 Many people raise their pickups up too high,and lose sustain and dynamics in the process as the pull of the magnets chokes the strings' vibration. I really would not be bothered paying any extra money for a signature set of Rory pickups, I'd save it and find a used set of 60s style vintage pickups by Seymour Duncan or the Fender Custom Shop 69 set..These 'over-wound' strat pickups lose alot of what makes a strat a strat (in my opinion)..you'll sacrifice some clarity and the ability to clean up the sound with the volume control with the hotter output. With the standard lower output pickups I think you get more range of sounds. 2.All traditional single coil pickups can be susceptible to noise, regardless of how old they are..it can be caused by noisy power and the resistors in stage lights. Shielding can be done but I reckon that unless you're experiencing unacceptable noise right now I wouldn't bother. To get it done professionally can be costly, but if you're handy and have the tools and the time then maybe you could give it a go, there are many 'how to' tutorials available online. 4.it's hard to tell from the picture but considering that shielding paint is the same colour as that (black/grey) it probably is, I remember reading that Rory had some shielding work done on the strat somewhere on the west coast of the states during a tour. Thank you very much for your help, David! Your help is very useful to me! Definitely not shielding paint. Looks like rubber cut to fit. Lot of other stuff in the cavity under it. Also in the pickup cavity. Man there's been some work done under that hood. Front pup taped over, middle pup a grey bottom post '63, bridge pup is a newer replacement, year ? all 3 appear re-wound or had the cloth covered wire replaced with plastic coated. Cap on the pup selector switch. All pickguard aluminium shield cut off except around the pots and pup selector switch. Very individual mods done to an Iconic guitar played by a Legend. Fabulous photo, thanks for posting and thanks to Kent Armstrong / Gallagher Family. Will definitely try those bad boys in one of my non orig strats. Re copper tape - in the UK, Garden centres sell small rolls of copper tape ( for putting round pots as s;lugs and snails don't like sliding over it!) I shielded a tele with it a while ago, to good effect. Was a couple of £UK to do this. Probably enough on the roll for 2 or three guitars. Not done either of my strats yet, but will at some point. Hello guys, I need your help! At last I have decided to buy Kent's Rory pickups for my strat. Few months of thinking. Next, I tried to find that box of pickups at Ebay store and found also assembled pickguard with Kent's Rory pickups. It looks very nice and costs $249 + $45 for shipping. Also any color of pickguards and pickups are available. An official site of Kent Armstrong didn't has assembled pickguards with Kent's Rory pickups. But it can be found at EBAY as well. Can I trust to the ebay seller? Where he got assembled pickguards with Kent's Rory pickups? I never knew that Rory used Kent Armstrong pick-ups, so now I have a better understanding of where the Eggle Berlin comes into the equation as it seems like too fancy a guitar for Rory's "taste" (:P). I have an Eggle Vienna and love the sound of it, I also have another guitar loaded with active KA pickups in a H, stacked H (looks like a singlecoil but actually a HB), H formation. Each has its own threeway switch with a push/pull boost on the volume control. I love the sounds available on these two guitars and cant understand why KA isn't up there with the Duncans etc.